Recent reports emanating from Aso Rock, the heart-beat of the Federal Capital Territory of Nigeria has revealed that the country's sit of power is deeply unsettled over the impending release of Nnamdi Kanu, the leader of Indigenous People of Biafra, come December 1, 2016 by an Abuja Federal High Court. A reliable source which pleaded anonymity disclosed to Family Writers that the Presidency, have come to terms with the inferiority of their argument and lack of evidence(s) to substantiate their opposition to the bail application filed by IPOB leader, Nnamdi Kanu and co-defendants who are standing trial on alleged treasonable felony. 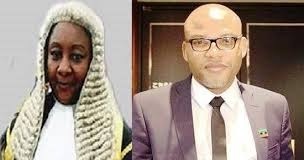 As a result, series of intimidatory attacks has been ignited by the FG through their DSS henchmen against Mrs. Binta Nyako, the judge who is expected to give ruling on Nnamdi Kanu's bail application on December 1, 2016. The source stated that the recent clamp down on some notable judges in the country by President Buhari's government is being used to intimidate subsequent judges into dishing out orders and rulings that are only favourable to the government. "Apart from the fact that Binta Nyako hails from the same state with President Buhari, I don't think any other judge in the country will like to experience the same fate that has befallen Justice Ademola and others, whose dissent rulings against the government have fueled the animosity between them," the source stated. Meanwhile, Family Writers have been reliably informed that some notable politicians in Biafra land, mostly of Igbo extraction have been directed by President Buhari to go and lobby Nnamdi Kanu in prison into dropping his demand for the freedom of Biafra, as that is the only precondition under which he can be released from prison. It has been revealed that during a meeting with these politicians, President Buhari had vowed that not even the impending ruling of the Federal High Court on Nnamdi Kanu's bail application will make him release the Biafra leader. Dear brother one thing I want you to remember is that you are not alone there are people who are praying for you every day even if others don't I do pray for you every morning and every night commenting you into the Hands of our Holy and Blessed Virgin Mother, the Mother of the motherless She most surely see you true so do not be afraid. No intimidation or sand bagging by Buhari and or anyone will stop the restoration of the Christian Nation of Biafra. I thank the Yorubas for electing Buhari as president because without Buhari the restoration would be have been a wishful thinking, but now it's a done deal. Dr Nnamdi kanu millions are praying for you every day you are not in the same level with Buhari let him keep bragging because of the soldiers and DSS but one thing remain, when a dog want to die he or she will not hear the smell of a bowel.in 1984 he brag to arrest those that are connected with Gloria okon but in no short time he couldn`t know what government is all about, it is very good for one to know the up and down of life but Buhari does not understand and he will not. Biafra or death is not a treat.